The Modular Tactical Vest (in short: MTV or MoTaV) is a ballistic vest originally adopted by the United States Marine Corps in 2006. The MTV was designed as a solution to shortcomings in the current, decade-old Interceptor body armor (IBA) and was selected after a rigorous proposal and examination process by the Marine Corps. The MTV provides better protection levels than the IBA, although it uses the same Small Arms Protective Insert (SAPI) plates. The MTV weighs 30 pounds (14 kg); three pounds more than the IBA, but is designed to more effectively distribute its weight throughout the wearer's torso. The Navy also ordered 28,000 MTVs in August 2008. After conducting a survey of more than 1,000 Marines and finding that a majority of the Marine Corps had been overall highly satisfied with the MTV, in January 2009 the Marine Corps announced that it would be making some modifications to the MTV to improve comfort, mobility and safety. The Marine Corps awarded a major contract to Protective Products International (subsidiary of Protective Products of America) to produce 60,000 vests, and began fielding them in 2007 and a continued roll-out is expected. The Navy also ordered 28,364 MTVs in August 2008. Quick-release system to remove the vest in emergencies, meant to help corpsmen get to an injured Marine's body. Troops complained that the pull string got caught on equipment and the MTV would accidentally fall off in the middle of battle. Greater coverage of the lower back, side torso, and shoulders. Integrated channels for communications wiring. Rifle bolster to assist in seating the wearer's rifle. Same modular PALS webbing as the Interceptor. A changed closure system. This was intended to be an improvement, but some wearers have complained that it takes too long to put on because the vest slips over the head. An updated version of the MTV is currently in production to address these issues. The vest is donned and removed using a hook-and-pile "cummerbund," which fastens around the waist, and a buckle atop each shoulder. Some users have complained that the vest is more time-consuming to don (especially with a full combat load attached) when compared to the Interceptor's single hook-and-loop flap. The quick-release system was designed in response to concerns that the Interceptor was difficult for medical personnel to remove from incapacitated troops, and in some cases had to be cut off. When pulled firmly, a cord at the bottom of the vest causes the cummerbund to separate into two pieces. The shoulder buckles can then be unfastened and the vest removed in pieces, with no need to change the casualty's body position. In July 2013, the Marine Corps announced it will buy 3,800 Improved Modular Tactical Vests. The IMTV is made for smaller stature Marines who cannot wear the full-sized MTV comfortably. The vest comes in small-short, medium-short, and large-short sizes. Most Marines use the Scalable Plate Carrier in the field, so it is hoped that the additional sizes will encourage Marines to wear the IMTV in combat. The Corps does not want to design female-specific body armor, and has found that the issue was different statures related to the length of the torso. The IMTV can fit women, as well as smaller stature men. ^ Defense contracts August 07, 2008 "Protective Products International, Sunrise, Fla., is being awarded a $17,395,304 delivery order #0003 under a previously awarded firm-fixed-price, indefinite-delivery/indefinite-quantity contract (M67854-07-D-3065) for 28,364 MTVs (modular tactical vests) and associated new equipment training. Work will be performed in Sunrise, Fla., (60 percent); Granite Falls, N.C., (30 percent); and Fenton, Mo., (10 percent), and work is expected to be completed October 2009. Contract funds in the amount of $17,395,304 will expire at the end of the current fiscal year. This contract was a sole source award. The Marine Corps Systems Command, Quantico, Va., is the contracting activity." Program Manager, Infantry Equipment Combat Equipment. "Modular Tactical Vest" (PDF). Combat Equipment Support Systems, Marine Corps Systems Command, United States Marine Corps. Archived from the original (PDF) on February 26, 2007. Retrieved 2006-12-08. Jeff Schogol (October 22, 2006). "Marines downrange to get new body armor in '07". Stars & Stripes. Retrieved 2006-12-08. "U.S. Marine Corps Selects Protective Products International (PPI) For Prestigious Contract". PoliceOne.com. November 2, 2006. Retrieved 2006-12-08. "Systems Command improves Marines' combat effectiveness with new Modular Tactical Vest". Marine Corps News. United States Marine Corps. November 20, 2006. Archived from the original on 2006-11-24. Retrieved 2006-12-08. "Issued body armor is best available for combat". Marine Corps News. United States Marine Corps. May 29, 2007. Story ID#: 20075297470. Archived from the original on 2007-07-07. Retrieved 2007-06-02. "MODULAR TACTICAL VEST (MTV)". Program Manager, Infantry Combat Equipment. USMC LOGCOM. Archived from the original on 2008-12-04. Retrieved 2008-07-21. 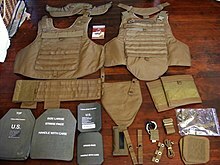 Wikimedia Commons has media related to Modular Tactical Vest.